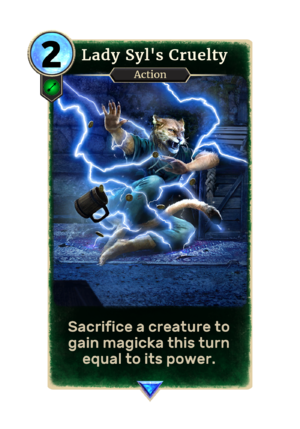 Sacrifice a creature to gain magicka this turn equal to its power. Lady Syl's Cruelty is a rare Agility action card. It is part of the Isle of Madness story set. This card refers to the quest The Lady of Paranoia in the Shivering Isles expansion for Oblivion, in which Lady Syl's penchant for using shock spells to torture her subjects is depicted. The victim depicted is Ma'zaddha. This page was last modified on 26 January 2019, at 23:25.